Here's an Operation Christmas Child shoebox my mom packed for a 2-4 girl this year. I thought I'd share what she put in in case it was of interest to others. This shoebox was 348 inches cubed, for comparison, a GO box is 306 in3, so it's pretty close in size. Here's one of the 2-4 girl shoeboxes she packed in 2015. If you'd like ideas for other ages be sure to check out my posts on OCC shoeboxes from this year for: Boy 2-4 , Girl 5-9, Boy 5-9, Girl 10-14, & Boy 10-14. NOTE: Different countries have different restrictions on what can be packed in an Operation Christmas Child shoebox due to customs, and this is the last year for candy. Be sure to check the guidelines from your national organization before packing! You can see the bottom layer had to be laid out oddly to fill in all the holes around the bowl, you can see the soft items are together and the hard/square things went next to each other, trying to fill in every possible hole! You can see the candy and soap went on opposite ends to separate the smell as much as possible. You'll also notice crayons are in a bag, that's due to the results of our Crayons Heat Stress Test. Finally, put the last few items in, slid the notebook and coloring book down the side and folded over the top. You can see details of exactly how to do this in this post: How to Fit a Full Sized Notebook or Coloring Book in an Operation Christmas Child Shoebox. 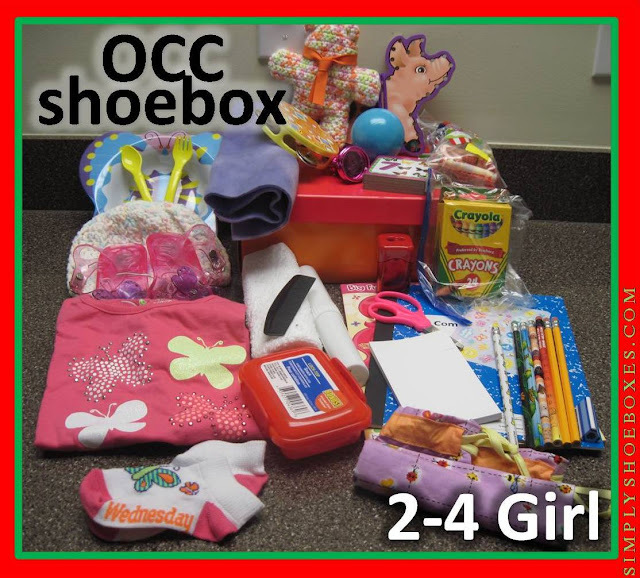 You can see more Operation Christmas Child shoeboxes for 2 to 4 year olds.